Starring Cliff Robertson, Robert Duvall, Luke Askew, R. G. Armstrong, John Pearce, Matt Clark, Dana Elcar, Donald Moffat, and Wayne Sutherlin. Most of the members of the James-Younger Gang had ridden with Confederate guerrillas William Quantrill and Bloody Bill Anderson along the Missouri-Kansas border region during the American Civil War (1861-1865). In retaliation for the guerrillas’ raid on Lawrence, Kansas on August 21, 1863, which left 185 men and boys lying dead on the ground, the section of Missouri that bordered Kansas was completely depopulated to deprive the guerrillas of their support network. When the war ended, the guerrillas and their families tried to rebuild but they suffered frequent harassment and found it nearly impossible to obtain loans from Northern-controlled banks. Hardened by years of partisan warfare, a number of them began robbing banks, initially under the leadership of Archie Clements. After his death in a shootout in December 1866, Frank and Jesse James and Cole Younger became the core of the gang. The narration at the beginning of the movie states that the railroads started forcing innocent farmers off their land in Missouri before the wounds of the Civil War had had time to heal. Refusing to give in, the James and Youngers had tarred and feathered the railroad men, driving them out of Missouri. Standing up to the railroad men made them outlaws, but the people of Missouri remembered. In 1876, the Missouri State Legislature examined a proposal to give them an amnesty, so that the outlaws could return home. While the amnesty was being debated, the railroads had hired the famous detective Allen Pinkerton, who had vowed to hunt down and kill the gang before they could be granted an amnesty. Cole Younger had made the gang stop robbing banks in order to not affect the amnesty debate but Jesse resents his leadership and has no interest in any amnesty. 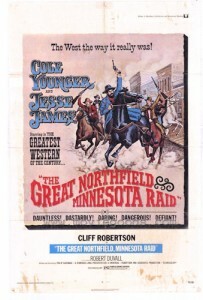 Cole’s apparent death in an ambush by Pinkerton agents gives Jesse the excuse needed to ignore the amnesty and fight back by robbing a bank in Northfield, Minnesota. When bribery by the railroad companies prevents the legislature from passing the amnesty bill, Cole agrees to join the raid. Unfortunately, the outlaws discover that the residents of Northfield keep their money at home because they know that the bank does not have enough gold to cover its deposits. Intrigued by the bank president’s lack of moral fiber, Cole proposes a plan to defraud the depositors, but it is actually an ingenious scheme to trick all of the townspeople to deposit their money in the bank so that it can be robbed. Meanwhile, Pinkerton is leading a large number of agents to Northfield, setting the stage for a showdown. Early in the movie, Allen Pinkerton sends men to ambush the Youngers, saying “this is war, to the knife, and the knife to the hilt.” While it is true that the real Pinkerton Detective Agency had hunted the James-Younger Gang, Pinkerton’s pursuit had ended a year before the raid on Northfield. There is no denying that Pinkerton hated the outlaws. Having lost three agents to the gang, Pinkerton had continued the investigation even after his original client, an express company, had dropped the case. Humiliated and furious that three agents had been killed without any arrests, Pinkerton wrote the superintendent of the agency’s New York office “My blood was spilt, and they must repay. There is no use talking, they must die” shortly before his agents raided the James’ farm in January 1875. An incendiary device thrown into the farmhouse exploded, killing their eight year-old step-brother and wounding their mother so badly that her arm had to be amputated. The uproar caused by the bungled raid led to the submission of a bill guaranteeing a pardon for their war-time crimes and a fair trial for the outlaws, but it was narrowly defeated in the legislature. Instead of chasing the outlaws or interfering with the vote on the amnesty, the actual Pinkerton was in Illinois, relying on the governor’s protection to avoid extradition to Missouri to be tried for his involvement in the raid. Clearly a fair amount of research had been done, therefore the changes were made to suit the story. It has the right participants of the raid, but Charlie Pitts and Bill Chadwell are presented as long-term members of the gang, when they were actually recent recruits. It is true that Bob Younger resented Cole’s overbearing personality and had fallen for Jesse’s charisma. The screen Jim Younger does not talk because he was shot in the mouth by a Bushwhacker. In reality, the wound was received at Northfield, and it seems unlikely that he would have been shot by a Bushwhacker, since Confederate guerrillas in Missouri were called Bushwhackers. Duvall plays Jesse with a rattlesnake-like menace, pretending to see visions in order to win leadership of the gang from Cole, and even stealing Cole’s idea for the Northfield raid, although he has no genuine loyalty to the other members of the gang. This version of Jesse is a borderline sociopath, who kills men on a whim, does not believe that the war is over, and views all Yankees as prey. Always carrying a Bible, Frank is a bit simple in the head and worships Jesse. In the movie, Clell Miller had given up robbing for his wife, who hates the outlaws, but he joins the raid because he misses the excitement. Although the real Clell Miller had been an active member of the gang for several years before the raid on Northfield, this is a key element in the history of the real James-Younger Gang. By 1876, many members of the gang had settled down and were unwilling to risk their lives robbing banks. Only younger outlaws like Jesse still craved the adrenalin rush. The script has a very good grasp of the economic situation in the United States at the time, showing how people struggled to survive outside events beyond their control, such as bank crashes, crops destroyed by locusts and influenza epidemics. The real gang did spend a couple of weeks in Northfield, posing as cattle buyers and staying in the red light district to avoid attention while they mapped out escape routes. A large portion of the film takes place in Northfield, which enables Kaufman to support the theme that technology is rapidly transforming the outlaws’ world. They are literally stunned when they see a steam-powered tractor and are surprised by the new national pastime, baseball, which appears to have been more rough-and-tumble then. While it is not mentioned by the screenplay, the gang’s future was grim. Recent recruit Hobbs Kerry had been captured about a month earlier after throwing around money from his share of the proceeds of a previous robbery. Although he did not know anything about the planned raid in Northfield, he had confessed the names of the members of the gang, so the noose was tightening around the outlaws. The key players in Northfield appear but they are given different roles. Nicolaus Gustavson is a crazy man who had lost his son during the war, instead of an innocent man caught in the crossfire. Henry Wheeler was a medical student but there is no evidence that he was so near-sighted that he was almost legally blind. The greatest change is the transformation of the bank president into a greedy slimeball, who justifies his willingness to cheat the townspeople by saying that financiers and speculators like Jay Gould and James Fisk did the same. This portrayal ignores the fact that the gang decided to rob the bank at Northfield because one of its owners was ex-governor, senator and Union general Adelbert Ames, while former Union general Benjamin Butler had deposited a very large sum of money in the bank. Furthermore, banks typically had a reserve in greenbacks (paper currency), not gold, to cover withdrawals. However, the transformation aids Kaufman’s unflattering look at establishment figures, although the hanging of innocent men by worked up posses was probably far too common, since justice was often hard and fast at that time. Despite meticulous planning, Cole’s robbery does not go as planned, and the entire town starts shooting at the gang but run away when the outlaws fire back. In reality, a handful of residents calmly picked apart the most feared gang in the United States. The story gets the general facts right, showing who was killed in the town, who died during the pursuit, and who goes to prison, but the survivors had received many more wounds during the shootout in front of the bank. While the screenplay may have stretched the facts, it is definitely an enjoyable movie, largely because of Robertson’s Cole Younger, who strolls through the film expressing wonderment at each new technological marvel. 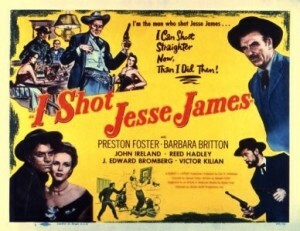 The scene where the James brothers are trying to remember if they had ever robbed an innocent man, aside from the banks and railroads, while sitting next to each other in an outhouse gives the film an earthy feel. 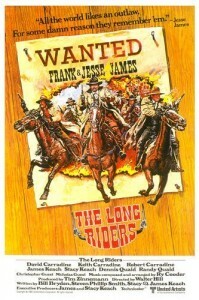 Despite the setting, the movie is more of a caper than a traditional Western. 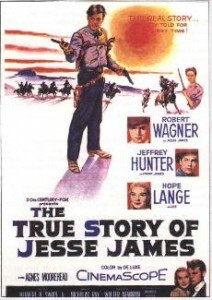 It is also the first Jesse James movie where Cole, not Jesse, originates the idea for the raid, as well as destroys the myth that the outlaws stole from the rich and gave to the poor.